The Great Western Railway first produced what was to become their iconic standard goods brake van early in the 20th. century. They retained the style, with refinements, up to and into nationalisation. The design gives quite a commodious van with a large heated cabin and a covered veranda at one end. A disadvantage from the guard's point of view was having to operate the handbrake and sanding gear in this area, away from the heated interior! Built to GWR Diagram AA13 (we understand in 1913 and possibly within Lot 817), 17908 is one of 275 to this design built between 1913 and 1918 at Swindon. 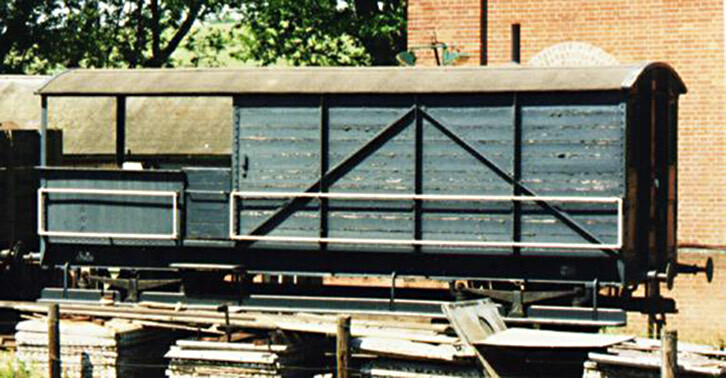 It is a 20 Ton goods brake van with handbrake only and known by the telegraphic code "Toad". This van has the cabin side timbered to floor level. In later vans, the planking below waistline was replaced by steel sheet. GWR practice was to allocate brake vans to certain runs, and this one spent much time based at Cardiff. Traces of GW-style "Cardiff" lettering were discovered under layers of paint, while the BR paintwork showed the van as "Cardiff R.U. ", indicating a regular working to Salisbury. W17908 was withdrawn from BR service in December 1958 and was subsequently sold to the Oxfordshire Ironstone Company for internal use at their quarry near Banbury, where it became their "No.6". Its principal role here was to carry quarry workers from the booking on point by the engine shed to their place of work some distance away. The van was sold to the Southern Locomotive Preservation Company in 1967 and was delivered by rail to Liss, on the Longmoor Military Railway. It came to Bluebell with the rest of the SLP stock (including USA tank 30064 and Maunsell brake composite 6686), arriving on 1st. October 1971. Since its arrival, 17908 has been used by Civil Engineering staff. It is externally restored to GWR condition and is serviceable, although it normally can be seen at Horsted Keynes. A history of GWR Goods Wagons, by Messrs. Atkins, Beard, Hyde and Tourret, published by David and Charles. These books are out of print but used copies may be available from the Carriage Shop at Horsted Keynes which is open most weekends. Page last modified by Nick Beck, 13 January 2014.